Can you build your retail brand by installing a free charging station out front? A San Francisco startup says you can! More drivers are choosing electric cars, increasing the need for convenient charging locations. And more retailers are discovering the benefits of projecting a green image making this the right time for Volta. With more than 100 locations in California, Arizona and Hawaii and plans to build a national network, Volta has hit on a viable model: get the retailers to pay for the stations and the power in return for installation, signage, green image and a captive audience. Why not shop while you get a free charge? The company started in Hawaii which has the highest per capita ownership of electric vehicles and has now expanded into the San Francisco Bay Area, Los Angeles, San Diego, and Phoenix. Clients in San Francisco now include Whole Foods, Macys, Sungevity and various public spaces. We like the way this model works as a catalyst for change. First, it offers the sponsor-clients the opportunity to build a green image. Then it attracts electric vehicle owners to “fill up” for free at their stores during the average 75-minute charging event, making shopping convenient for their captive audience. Then, because the charges are so visible to all their shoppers, it encourages more gasoline drivers to go electric. And lastly it helps the community establish an infrastructure that enables the future to be greener. Basically this is an advertising model where the clients get the word out about their goods and services by providing recharging stations and power in return for customer loyalty and a socially conscious image. We always say, “If you really want change, put a buck on it!” This model makes it cheaper to “fuel up” with the sponsor’s power than to buy gasoline. 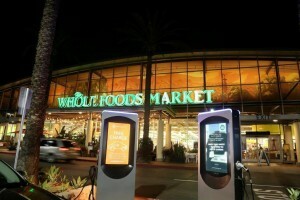 It also compels electric vehicle owners to charge up at their favorite stores while they shop rather than at home where they have to pay for the charge. Volta Co-founder and CEO Scott Mercer said, “We’re driving the price of both the service and the infrastructure to zero as we tap major brands to join our community engagement model. Early Internet pioneers like Google became industry titans by first offering free consumer services online paid for by companies that advertised on their platforms. With Volta, we’re applying a similar business model to infrastructure to align social good and community services with like-minded brands and retail partners that want deeper engagement with the communities that they operate in.” According to the company’s web site, Volta has given away over 3 million electric miles worth of power since its inception in 2012. This is the equivalent of 133,000 gallons of gasoline. Volta has now entered into relationships with 7 of the top 10 national real estate investment trusts to provide premium retail locations for new charging stations. Their immediate goal is to expand its network of more than 100 outdoor stations. Their long term goal is to position brands as enablers of the future. We say BRAVO! This is how change happens!